*Add a qualifying Milwaukee M12 Kit to your cart and the free item will automatically be added. Limit 2 free items per customer. Valid on select items, qualifying items are identified on the product page. Offer valid until 11:59pm ET on April 30, 2019 or while supplies last. No adjustments to previous purchases. Subject to change without notice. The M12 FUEL HACKZALL is the fastest cutting and most powerful saw in its class, delivering over 4X more run-time, up to 70% faster cutting, and up to 6X longer tool life than competitive saws. The compact, one-handed design provides superior control and the ability to make cuts in tight spaces. Its lightweight design is optimal for overhead cutting applications. The POWERSTATE Brushless Motor outperforms all leading competitors with constant power output, yet runs cooler with no wearable components. REDLINK PLUS Intelligence ensures optimized performance and protects your investment from overload, overheating, and over-discharge. The M12 REDLITHIUM XC 4.0 Ah Battery Pack provides more work per charge and more work over the life of the pack than competitive batteries. The dual gear counter balance mechanism significantly reduces vibration, providing faster starts in metal and reduced user fatigue. One-handed design provides superior control and versatility over a standard recip saw. Blade Stroke Length: 5/8 in. I use this tool almost every day, and with a 6.0 battery I can go all day with one charge. I am constantly recommending it to peers and other contractors when they ask “if I like it.” It’s definitely the little engine that could! With all the sales CPO offers, you get your money’s worth the first day you use it! I usually don’t write reviews, but for this tool, I feel obligated. Don’t hesitate, Get One! This thing is awesome! Running a 6" sawzall blade it took forever to run the battery down. I own quite a few M12 and M18 Milwaukee tools and they never cease to amaze me with their power and runtime. This Hackzall is way more convenient than a sawzall for most stuff. trabaja muy bien y para mi trabajo me resuelve mucho. Highly recommend it, smooth operation, easy to control in tight spaces, quality look and feel! Gets the job done. Could use a bit more power. I bought the M12 Hackzall primarily to do light pruning on shrubs and trees. I thought it would be faster than using a traditional pruning saw for little jobs that are too small to use a chain saw. As it turns out it works very well for my intended purpose. I use a pruning blade for those jobs. Now that I have it I've also found myself using it for small building/remodeling projects (with various blades) in place of my full size reciprocating saw. My only quibble is a small one: the mechanism for changing the blade is a bit awkward. But that's a minor issue. All and all I am very pleased with this small recip saw. How much does the saw weigh? Is it the same size as the 18v version? BEST ANSWER: It is pretty light weight it I think around 3lbs without the battery 4 with the 4.0hr extended battery. It's noticeably smaller than the m18 version. I also chose this one after reading nasty reviews of the m18 version and I've become a bit of a fuel brushless odor snob as the m18 does not have brushless. It about 11inches tool only and the motor housing is smaller for fitting in tighter spaces. This was not a replacement for big demo projects requiring a full size sawzall but it has very successfully cut through wood and screws as well as pvc and conduit. I would highly recommend this if you have smaller cutting project or working in tighter spaces like between floor joists, studs, or under cabinets as its compact and easily controllable with one hand. This saw is a bit heavier and a bit bigger in size which is a good thing because of it the tool itself can do more of the work so you don't have to force it through the materials you are cutting. I have both the old and new and I highly highly recommend the fuel over the standard model. I use these tools very often in my remodeling business and I am very impressed with both power and battery life of the fuel. compare to the small 18v version. The 2520-21xc weighs 7.5 with battery.It is more compact than the 18 volt version. This will weigh 7.5 pounds. Can the m12 fuel use the red lithium 2 & 3 amp batteries or just the 4 & 6 amp? 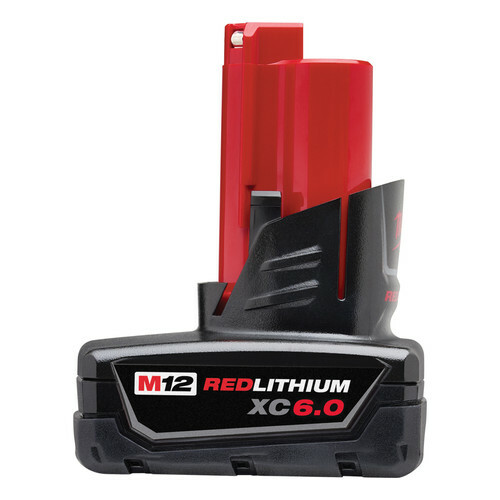 BEST ANSWER: All Milwaukee M12 batteries are Red Lithium. This tool will accept all M12 batteries, regardless of the amp hour. The bigger the amp hour, the longer the runtime. Yes it can use any M12 battery.